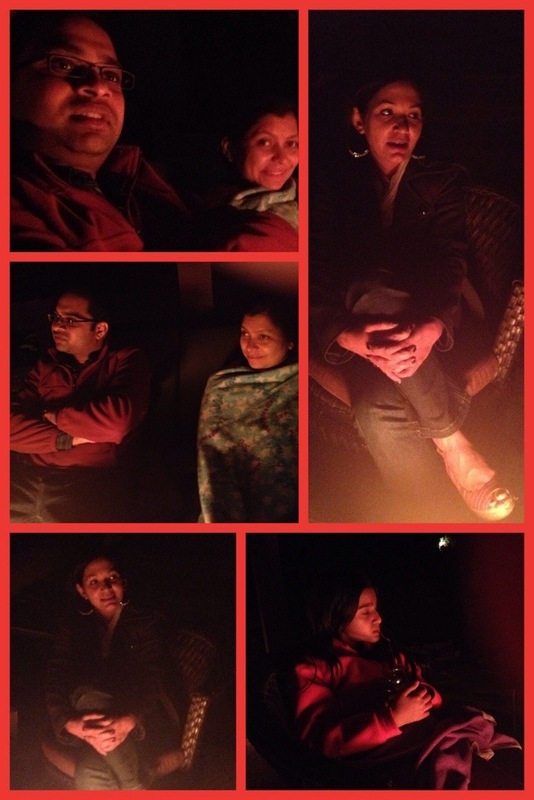 Fooling 47 (and counting) FB friends into wishing us Happy Anniversary …. PRICELESS!! In my previous post I mentioned that Sharmila told me “No” on this day 21 years back. I also mentioned that it took me of few months to turn her around. At this point, you have to imagine me like the meerkat in that famous Lion King scene when the lioness Nala is trying to attack them and they just realized that she is a friend of their friend and protector Simba. 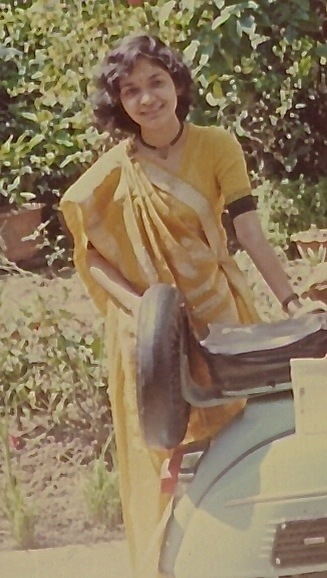 Exactly twenty one years back, to the day, while taking an evening stroll near Netaji Bhavan in A-Zone, Durgapur, I had asked the girl in this picture if she would marry me. Months of intense negotiations later, I was able to get the deal done! As I recollect, part of the negotiations included me agreeing to buy her a landline phone and a car sometime during our married life!! Category: My Family | 27 Comments on October 30th!! I come to DC fairly regularly but mostly stay in the Reston area where my office is. It used to be the case that the office was in Arlington and because of business reasons, I had to come every week. 143 nights in 2011, I slept at the Marriott Keybridge. After nearly two years, I spent last night at the same hotel since I had a customer meeting in Alexandria. After finishing the early morning run by the Potomac river (it is one of my most favorite running trail), took a quick shower and was almost stepping out of the hotel (I was running late) when I started to wonder if Ruth was still working there. Turned around, went to the Concierge Lounge on the 12th floor – and sure enough she was there!! Age has started to take its toll but her spirits were high still! Every single day, this grandmother would greet me and make me fresh pot of coffee. She did the same today! I pushed my office meeting and decided to spend ten minutes with her to catch up on her life. 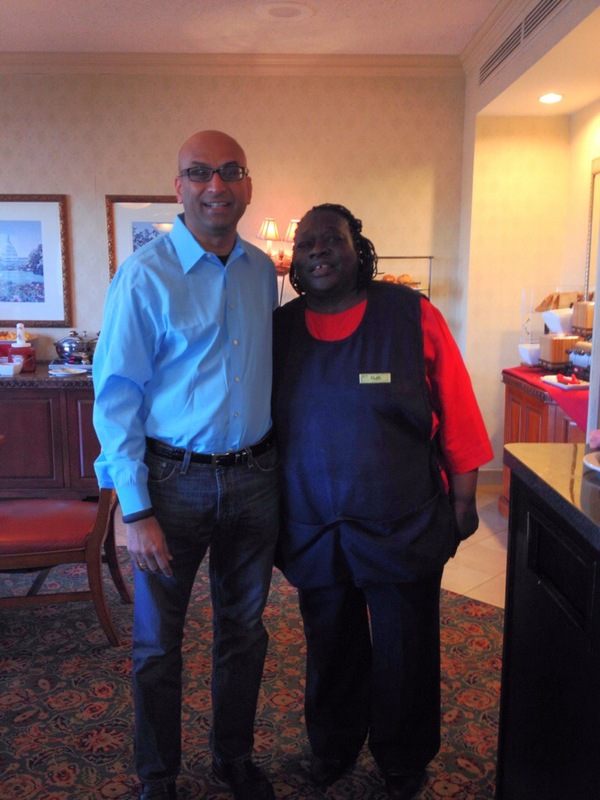 She has completed 35 years with Marriott!! 20 years at the same hotel!!! Born in Danville (near here) she has spent most of her life here. She has heard a lot of stories about other places from the hotel guests but never has traveled anywhere! She makes friends with transient guests like me (or even employees) who come regularly for some time and then go away for ever. She had amazing memories of a lot of her guests that she has not seen for aeons and aeons. Just like we form relationships in our life. Except her movie of life always runs on fast forward. After ten minutes of coffee together, we got a guest to take a picture of us and I promised to see her at least one more time before she decided to call it quits. It was past 9 pm. I had just wrapped up a customer dinner meeting in Alexandria in Virginia. Common sense would dictate that I drive back to the hotel and hit the sack at my usual 10 pm. But then I would have missed the chance to meet this unusually nice couple!! 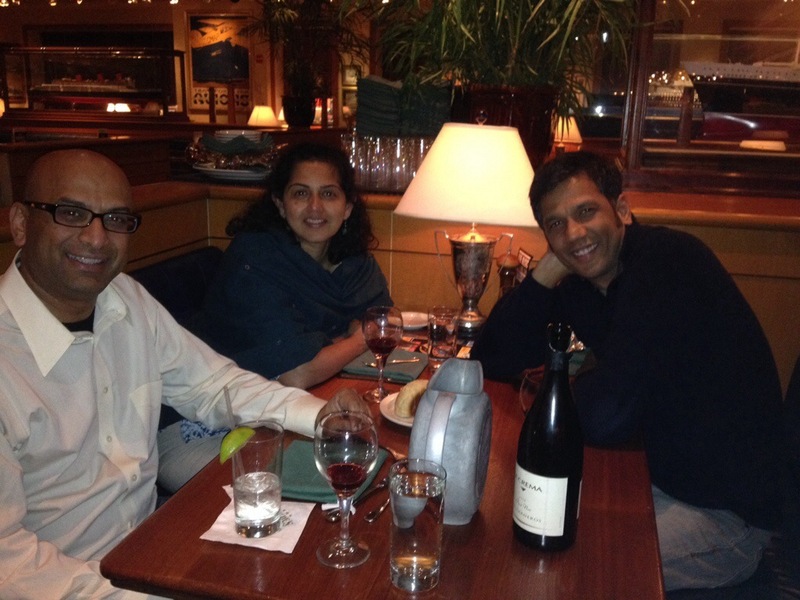 So I drove to Maryland to catch up with my one year junior and hostel mate from Engineering days – Singapore and his wife Soumya – who I knew independently thru other friends before they got married! Sundararajan Thyagarajan is his name. Within a few minutes of he showing up at our hostel, the outstanding thing about him we found out was that he lived in Singapore with his parents forsome time. And that is all it took us to give him the nickname “Singapore “. For 25 years, I had forgotten his real name till he reminded me tonight. Soumya and I got to know each other thru our dear friend Srimathi who we lost to cancer (she fought the first one off and lost a leg but succumbed to the second one) nearly 15 years back! Words can’t possibly do justice to the joys of seeing them again and recreating some “intersection points” !! Category: Intersection Points | 20 Comments on Singapore!!! USA Today headline reports that “4 Oklahoma prisoners escaped from a ‘escape-proof’ prison through the shower vent”. The temperatures keep falling but the Bengali herd shows no signing of thinning out. 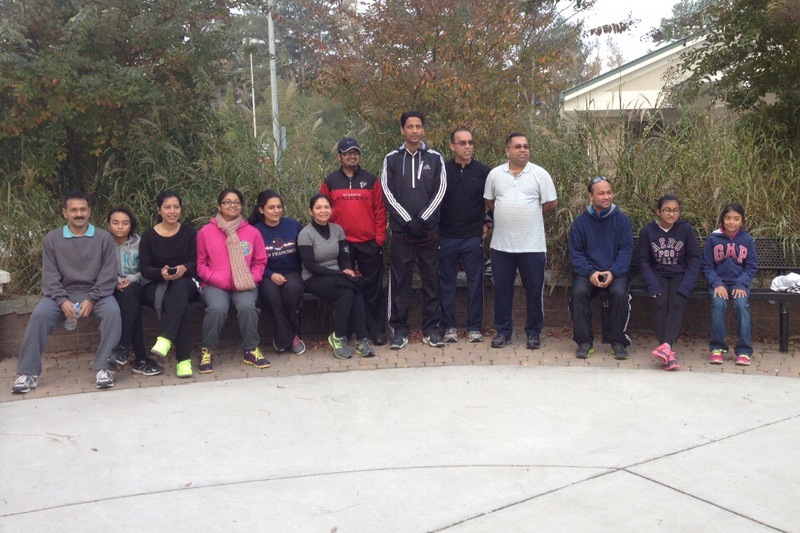 Fourteen runners showed up in chilly conditions to run the Sunday morning run! Special shout out to Raya – barely 10 years (rightmost in the photo) – who dragged herself out of bed, slept in the car as we waited for everybody to show up and then when we were ready to run, she kicked her blanket and started with us. That is something I have to remember those days when I feel too sleepy to get up and run! After the quiet evening yesterday, came the loud evening today. Really loud. 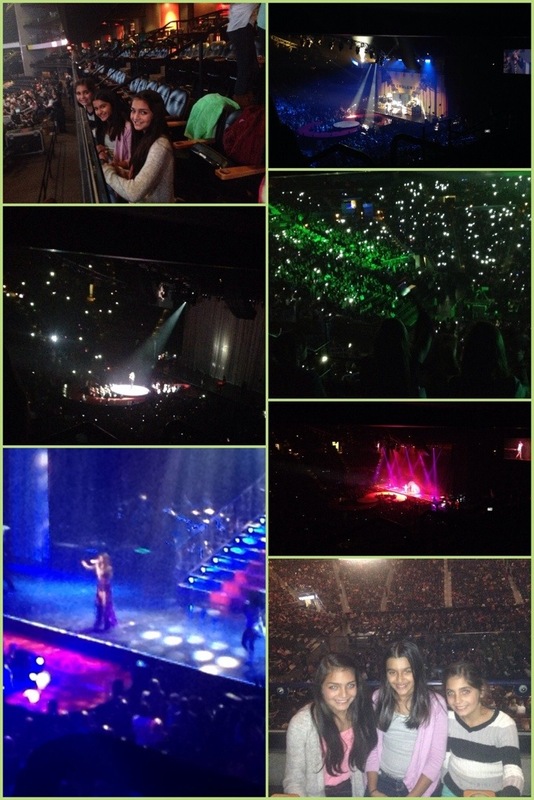 At the Selena Gomez show chaperoning Nikita and her two friends. Now, most of you know that I am as much conversant with Western music as I am with the inner workings of the Higgs Boson theory 🙂 As a result, I have no clue what they are singing or which one is Selena, for that matter. Without my red wine, I would have been a nervous wreck by now! That said, I am amazed by a few things in Western music compared to the Indian music I practice or listen to (admittedly it is not Bollywood music). 1. The sheer amount of energy. This is not a great orator moving the crowd with brilliance of words. Most of the audience can barely see the singer. But a couple of familiar songs into the show, the crowd is on its feet breaking into dances as if in a trance!! The music that I grew up with – the audience would quietly listen and give an approving nod or a smile at the end if it was a great rendition. 2. The ability of the singers to run all over the stage, jumping, hopping and yet singing along without missing a note. How they don’t pant and lose breath, I can’t understand. I can barely say a few words after a quarter mile run! Singers that I grew up with would sit in one place for hours. Harmonium was about the only exercise they got! 3. So much else goes on with the song. The pyrotechnics, stagecraft, lights, waving of LEDs, megawatts of sound. The music I grew up with was bereft of all these. The power of Western music, I am learning, can move a large crowd physically off its feet, at once. The power of Eastern music that I grew up with, I know, transcends the person, one at a time. I am absolutely fascinated by the power of both! !